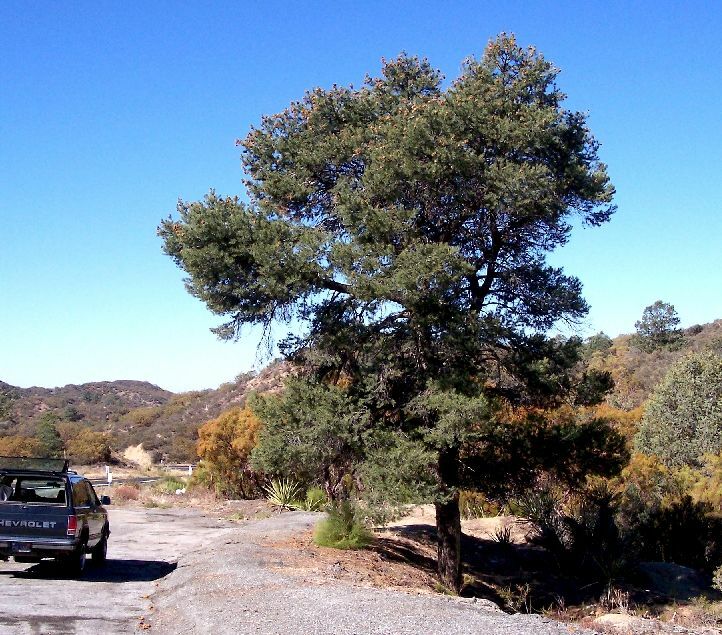 On 18 October 2007 I did a pine survey along SR371 northeast of Anza, SR74, and SR243 to Idyllwild. The survey was primarily to get a rough idea of the locations of the yellow pines, but I recorded all pine species at each location. My second stop was at a turnout just south of the National Forest Boundary, at an elevation of 4520 feet, where I was very surprised to find a two-needle pine. See pictures of this tree at the bottom of this page. I had previously seen a voucher of "Pinus edulis" from that area, and the plant I found might in fact be the source of this exact voucher: Grant, in 1951; Anza Bench region | Hillside in narrow canyon, several miles east of Anza on road to Hwy 74. Alt. ca. 4500 ft. The voucher actually says "2500 feet", but this must be a typo since elevations are all above 4000 feet east of Anza, and hence I made a comment on that voucher that the elevation was 4500 feet. The only other online voucher for "P. edulis" in Riverside County is Spencer, in 1924; Kenworthy. This location is at a Forest Service Ranger Station, and so might be a planted tree. It might also be another occurrence of this hybrid tree. I had intended to look for these vouchers someday, and was extremely pleased that this specimen just fell into my lap on this survey. WGS84: 33.55947, -116.60497, 4520 feet. This location is 0.8 miles southwest of the crest of the Thomas / Table Mountains Ridgeline, and just northwest of Burnt Valley, 0.07 miles south of the upper intersection of SR371 with Burnt Valley Road. It is on the edge of a fairly large paved area on the northwest side of the road. 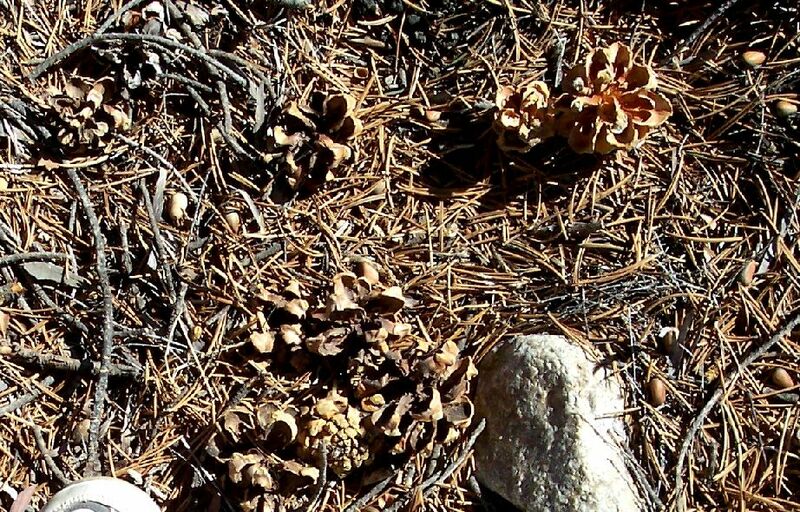 The only native two-needle pines in southern California are lodgepole pine, P. contorta ssp. murrayana, found only above 8000 feet here, and possibly P. edulis, whose nearest possible location is the New York Mountains at the eastern California boundary, 145 miles away. (There is some dispute about whether the two-needle pines in the New York Mountains are in fact P. edulis, or whether they are a two-needle form of P. monophylla). Using the Jepson Manual key, P. contorta is ruled out because the leaf sheath is deciduous and there is no prickle on the tip of the cone scale. Although it would appear that the determination of this tree is therefore P. edulis, that interpretation seems a bit far-fetched since this tree would then be very far out of range. It is of course possible that this specimen is a planted tree, but that seems unlikely at this remote location. There are three better hypotheses for the determination. First, this plant might just be an unusual P. monophylla which had split its single needle into two. This is known to occur in this species. This was my suspicion from the first time I saw vouchers of P. edulis from this area. Second, this plant might be a hybrid between two nearby species, P. quadrifolia (four needles), and P. monophylla (one needle). This possibility was suggested by Jon Rebman, who reports there are occasional two-needle pines in Baja California where these same two species are found. The area near this location is noted as having abundant P. quadrifolia (four needles), with large numbers of P. monophylla (one needle) to the east that include sparse numbers nearby (Minnich and Everett 2001, Conifer Tree Distributions in Southern California, Madroño 48:177-197). Third, this variation in the number of needles might just be an intrinsic property of P. quadrifolia. In further work, we have histogrammed the variation in the number of needles for four plants on the PCT south of SR74. The number of needles varied from 3 to 5 in those trees. We also surveyed the number of needles on specimens on the PCT north of SR74. Most specimens had three needles per cluster. One specimen had four needles per cluster; another had two needles per cluster; and one had half its branches with three needles per cluster and half with four needles per cluster. It is clear that P. quadrifolia in this area is simply "number of needle-challenged", and don't particularly care how many needles they have. The samples at the top are the two-needle pine. The first picture shows them on top of a standard 8.5 X 11 inch sheet of paper. The leaf placement on the twigs are very different. The two-needle pine is very clearly 4-ranked, and almost appears as having 2 ranks of opposite leaves. Its leaves are well-separated. There are ~16 needle-nodes per cm (16 pairs of 2 needles). The P. monophylla almost appears to have leaves in whorls of 6, with much denser spacing. Of course, its leaves are not actually in whorls, but if you look at the twig closely at the leaf bases, there are 6 leaves at almost the same horizontal position. There are about 50 needle-nodes per cm (50 individual needles). The scales are somewhat different. For P. monophylla, the slightly-persistent "scale" at the base of the sheath is ~2.0 mm long x 1.8 mm wide at base. The top half readily breaks off, leaving a 1.2 mm long stub. The scale is very widely ovate, narrowing little at the top. It is short-decurrent, if at all. This scale hardly persists at all. The scale of the two-needle pine is a bit more persistent, 2.5 mm long x 2.0 mm wide, and has a base long-decurrent on the twig. The smell of the two-needle pine is extremely strong, much stronger than the smell of the P. monophylla. A single twig perfumed my car, and my room. When I cut the leaves of the two-needle pine at home one day later, the smell again was very strong. The cut leaves of the P. monophylla were not as strong. The stomatal lines are very different. In the following, I note the number of lines on the concave and convex side of the leaves. Both trees have similarly-curved leaves. The leaves of the two-needle pine have 6 stomatal lines on the upper portion of the convex surface, that appear in two groups of 3, each group with a slightly different spacing. There are no stomatal lines on the sides. On the concave surface, there are 4 fainter lines, in 2 groups of 2. On the flat inner surfaces, there are 9 stomatal lines, perhaps with a tenth faint one on one of the two surfaces. The leaves of the P. monophylla have stomatal lines all around, fairly equally spaced. They are hard to count, since they are fairly faint. It appears there are 26-30 stomatal lines, with some of them being in close pairs. The most prominent lines are on the top of the concave portion. The number of vascular bundles in the needles is quite different. The two-needle pine very obviously weeps from 4 vascular bundles, 2 in each leaf, immediately upon cutting. The P. monophylla is much less clear about its "weeping". Instead, I see something like 20 small round bundles, which I assume are vascular bundles, around the perimeter of its needle. If I squeeze the leaves, sap comes from all 20 of those bundles. After leaving the leaves for a while without squeezing, there seem to be perhaps 4 larger collections of sap, with smaller collections from the other vascular bundles. The cones of the two-needle pine are significantly bigger, 55 x 50, 50 x 55, and 55 x 55 mm, with stalks of 6-7 mm. The cones of P. monophylla are 40 x 40, 45 x 45, and 45 x 50 mm, with zero stalk. The cones of the two-needle pine are light brown / slightly reddish-brown; the cones of P. monophylla are brown. In longitudinal cross-section, the scales of the two-needle pine cone have sides that are more curved down, as seen with the stalk up. 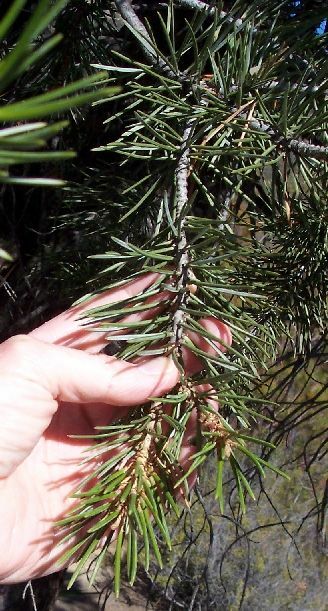 In contrast, the two-needle pine is inconsistent with a P. monophylla determination from these three characteristics. Further, as seen above, the two-needle pine has additional differences from my sample of P. monophylla on items not mentioned in the flora, such as the leaf placement on the twigs. Hence my first hypothesis is clearly ruled out; the two-needle pine is not an unusual P. monophylla. 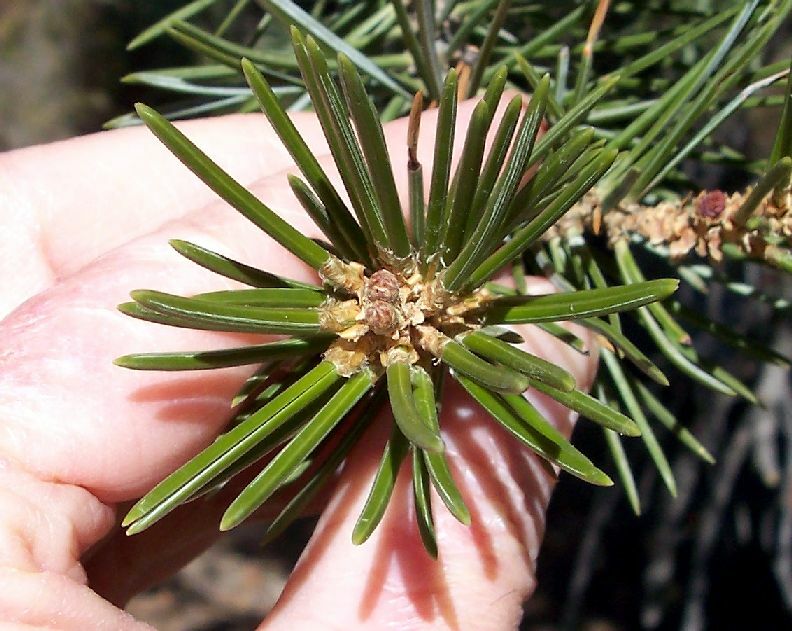 Could the two-needle pine be a planted specimen of P. edulis? The only clear inconsistency with the Flora of North America description is the cone size. At 5.0-5.5 cm, this exceeds the (3.5--)4(--5) cm range for P. edulis. It is also possible that the stomatal lines for this two-needle pine are inconsistent with those of P. edulis. The Flora of North America says all surfaces marked with pale stomatal bands. The observed lines are definitely not pale; they are very distinct. The lack of stomatal lines on the side might be a problem as well. These discrepancies, the fact that P. edulis doesn't occur within 140 miles of this location, and the remoteness of this location, makes it unlikely this is a planted specimen of P. edulis. Could the two-needle pine be a hybrid between P. monophylla and P. quadrifolia? Such hybrids exist, and would be expected here since the parent species overlap in distribution in this location. 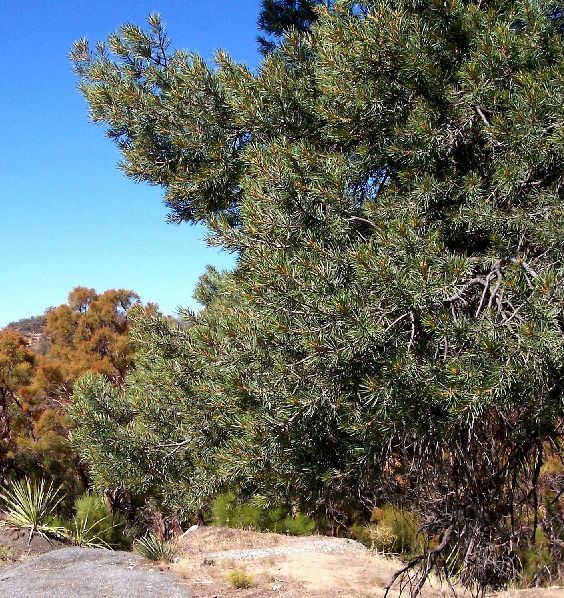 The Flora of North America treatment says Pinus quadrifolia is the rarest pinyon in the flora. It hybridizes naturally with P. monophylla. Hybrids have been observed in other locations where those two species overlap. The measurements above show no obvious inconsistency with the properties expected of such a hybrid. Two characteristics of this two-needle pine are very similar to those of P. quadrifolia. First, the stomatal lines of the two-needle pine seem to echo the adaxial surfaces mostly strongly whitened with stomatal bands, abaxial surface not so but 2 subepidermal resin bands evident for P. quadrifolia. Second, the leaf spacing and ranking of the two-needle pine is very similar to that shown in the following pictures of P. quadrifolia: picture 1 and picture 2. This determination therefore seems highly plausible, especially since any other possible determination has significant problems. Of course, to be absolutely sure that this is a hybrid, I need to analyze a specimen of P. quadrifolia, and check that the properties of the two-needle pine are indeed intermediate between those of the parents. I will try to do this in the future, as well as survey to see how close the nearest P. monophylla is. Could this specimen just be normal variation within the population of P. quadrifolia? Absolutely. It appears that the number of needles varies in some other populations of P. quadrifolia as well, and this may simply be an intrinsic property of this species. However, as discussed below, further analysis is needed to confirm or deny the hybrid hypothesis. It turns out this is a very popular tree! Not only has it possibly been vouchered as "P. edulis", it has also been determined as Pinus juarezensis x P. monophylla! And some of you may not believe this, but since all specimens of P. quadrifolia are considered by some botanists to be P. juarezensis x P. monophylla, this means that this two-needle pine would be considered part of the P. quadrifolia distribution. Don't that beat all! After the rest of this webpage was written, I wanted to add a reference for the claim by Lanner (1974) that P. quadrifolia populations are actually hybrids between a five-needle pine called P. juarezensis and P. monophylla. See Pinus quadrifolia description by Christopher J. Earle for more information about Lanner's claim (Earle originally called his page P. juarezensis). This claim is controversial; some botanists accept it, some do not. For example, Kral, in his 1993 Flora of North America treatment for P. quadrifolia, considers P. juarezensis simply as a five-needle form of P. quadrifolia. Minnich and Everett (2001) argue that Lanner based his claim from the only area where there is broad overlap between P. monophylla and P. quadrifolia, with those two species having strong ecologic and geographic segregation elsewhere. However, Price, Liston, and Strauss (1998), in their treatment in the 1998 book Ecology and Biogeography of Pinus, accept Lanner's treatment, as does Earle. The two graphs in Lanner (1974) appear to show that 2 and 3 needle pines are hybrids, having intermediate numbers of resin ducts and stomatal lines, but do not show any difference at all between 4 and 5 needle pines. In fact, Lanner presents no evidence anywhere in his paper that there is a difference between 4 and 5 needle pines with the exception of the twig hairiness for a single Rumarosa pine with an average of 4.58 needles. It looks to me like more work, notably a modern Principal Components Analysis using a number of characters, is needed to establish whether there is any difference between 4 needle and 5 needle pines, and whether specimens with fewer than 4 needles are hybrids or not. While searching for a reference, much to my surprise, I found that the tree analyzed here starred in a webpage by Christopher J. Earle, who called this tree just another of the P. quadrifolia hybrids between Pinus juarezensis and P. monophylla. Compare his photo #1 to the first picture below. Copyright © 2007-2014 by Tom Chester.